When you come to Santa Fe, you’ll immediately notice the prevalence of the arts. An artist’s eye will pick out the adobe walls, hanging ristras of chiles, and the energy of the city as inspiration. With such gorgeous scenery and rich culture, it’s no wonder many have been influenced by it. During your stay at Four Kachinas, you’ll have ample opportunity to experience New Mexico art. Come see for yourself! The New Mexico Museum of Art is a go-to place to see New Mexico art. Here, you can wander through exhibitions that feature both regional and international artwork. Once within its walls, you will discover the unique collection of works that draws hundreds of thousands of visitors each year. You’ll find both alternating and permanent exhibits that will inspire you with every look. Discover everything from contemporary photography to Post-War American paintings! When you’re in Santa Fe, it seems as if there is a gallery around every corner. In a place where New Mexico art is so prevalent, there are plenty of ways to experience it! Canyon Road is one of the best places to do so. This street is dotted with more than 50 galleries for you to explore. Here, you’ll find nearly every media imaginable used by local artists. See everything from traditional Navajo rugs to sculptures and paintings. With no fees to enter the galleries, it’s a favorite pastime for both locals and visitors alike. Fully immerse yourself in New Mexico art when you take a class. During your time in Santa Fe, each step you take through our breathtaking city will feed you inspiration. Channel that into a class of your choice to get something truly unique out of your vacation! These art classes are rooted in traditional techniques yet branch out into modern experimental forms, creating a unique blend. The alchemy of New Mexico art is a constantly changing mixture, so experience it yourself! When you stay at Four Kachinas, you will love experiencing our unique decor. 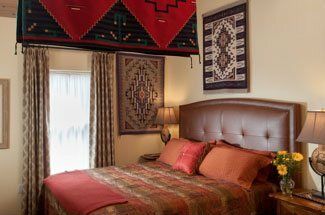 Each room features a different theme, many with authentic New Mexico art. 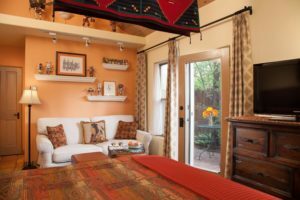 Browse through our cozy rooms that reflect the rich Santa Fe heritage with its Native American, Spanish Colonial, and Frontier history, then begin to plan your stay. If you’re interested in New Mexico art, we recommend our Kachina Room. Enjoy vaulted ceilings, Saltillo tile floors, and Native American artifacts and art that adorn the walls. Book your stay today! 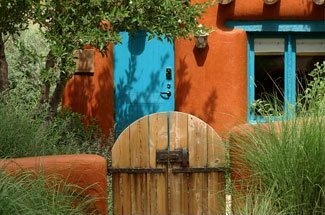 5 of Our Favorite Free Things to Do in Santa Fe — Which Is the Best Walking Tour of Santa Fe?